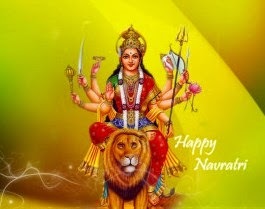 WISHING YOU ALL A HAPPY NAVARATRI. MAY MOTHER DURGA BLESS YOU ALL. Navratri is a festival dedicated to the worship of the Hindu Goddess Mother Durga. The word Navaratri literally means nine nights in Sanskrit, nava meaning nine and ratri meaning nights. During these nine nights and ten days, nine forms of Shakti/Devi are worshiped. The tenth day is commonly referred to as Vijayadashami or "Dussehra." Navratri is a very important and major festival in Maharashtra, Karnataka, Andhara Pradesh, Kerala and Tamil Nadu. Golu or Kolu or Bombe Habba or Bommai Kolu or Bommala Koluvu is a toy festival celebrated during the festival of Navratri in Southern India. 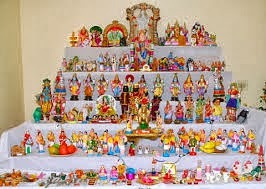 It is customary in the states of Tamil Nadu, Kerala, Andhra Pradesh and Karnataka, as well as in some Tamil communities within Sri Lanka to display Golu. This is an exhibition of various dolls and figurines in odd (usually 7, 9, or 11) numbered tiers (see picture). This festival is celebrated with great zeal in North India as well, including Bihar, West Bengal, Madhya Pradesh, Odisha, Gujarat and the northern state of Punjab. During the festival the traditional dance of Gujarat called "Garba" is widely performed. The auspicious festival of Navratri in 2013 will begin from Saturday, 5th October and will go on for nine days till Sunday, 13th October.